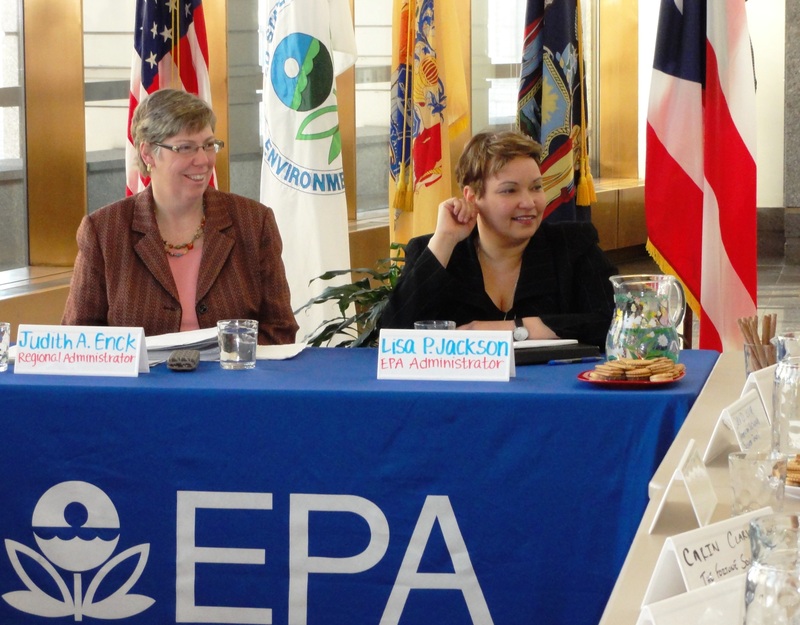 On November 5, 2009, Judith Enck was appointed Regional Administrator of Region 2 of the U.S. Environmental Protection Agency (EPA) by President Barack Obama. Enck stepped down from her EPA position on January 20, 2017. She was the longest serving EPA Region 2 Regional Administrator. Previously, she was Deputy Secretary for the Environment in the New York State Governor’s Office. Judith Enck is a Senior Advisor at the Institute for Governance and Sustainable Development. She recently was a Visiting Scholar at the Elisabeth Haub School of Law at Pace University in the Hudson Valley. At the EPA, Judith’s responsibilities were extensive. Her region included New Jersey, New York, Puerto Rico, the U.S. Virgin Islands and eight federally recognized Indian Nations. Enck oversaw the removal of PCBs from the Hudson River by General Electric; the cleanup of PCBs from light fixtures in NYC Schools; the environmental cleanup of NYC and NJ after Hurricane Sandy; and, the cleanup of the Passaic River in NJ. She also worked on a case of pesticide poisoning of a Delaware family vacationing in St. Johns. In her prior position as Deputy Secretary for the Environment under NYS Governor Eliot Spitzer and David Paterson, she was responsible for policies and operations of New York State’s environmental protection agencies including the Department of Environmental Conservation, Office of Parks, Recreation and Historic Preservation, Adirondack Park Agency, Agriculture and Markets, Department of State and others. Judith previously served for eight years as a policy advisor to the New York State Attorney General. Prior to that, she was Senior Environmental Associate with the New York Public Interest Research Group. She also served as the Executive Director of Environmental Advocates of New York, a non-profit government watchdog organization. She is a past President of Hudson River Sloop Clearwater, former Executive Director of the Non-Profit Resource Center and a designer of her town’s recycling program. She worked with the New York State Legislature to pass a number of the state’s most far reaching environmental laws including those addressing acid rain, toxics, pesticides, recycling, energy conservation and environmental funding. Ms. Enck is credited for helping to establish New York State’s bottle law and shutting down the Albany ANSWERS garbage incinerator in a low-income community. Her accomplishments in the field of environmental protection have been recognized with professional awards from the Attorney General’s Office, the Sierra Club, Center for Women in Government, Citizen Action, the Long Island Pine Barrens Society, and others. She is a graduate of the College of St. Rose in Albany, New York and was given the Distinguished Alumni award.